The Human Rights Exhibition Project is based on the archive of UNESCO's traveling Human Rights Exhibition from 1949. This historical exhibit was the first international event designed to visualize and disseminate the abstract contents of the Universal Declaration of Human Rights adopted in 1948. The first exhibition opened September 30, 1949 at Musée Galliéra in Paris. The layout of the exhibition guided its visitors along a weaving path through a series of large pillars and installations that illustrated the history of human rights and the UDHR's 30 articles through photographs and documents submitted by UNESCO’s Member States. After the inaugural show in Paris, the exhibition was converted into a portable exhibition album reproduced in 10.000 copies and sent to UNESCO’s 50 Member States. As a pedagogical, mobile resource, the Album’s contents were designed to be unpacked and exhibited in a myriad of venues around the world including schools, museums, libraries and other institutional settings to “help carry the human rights message in visual form to the peoples of many countries.”(Jamie Torres Bodet, Director-General). On this journey, it received harsh critique from e.g. the Catholic Church and Pakistan, both of whom claimed that their religious beliefs were under-represented in the exhibition. As a visual medium organized in accordance with the articles of the UDHR, the exhibition can be described as the first 'Visual Declaration of Human Rights'. As such it provides us — its contemporary viewers — unique insights into how the Declaration’s abstract principles were first visually conceptualized and propagated in the aftermath of the Second World War. Despite the fascinating insights, the story of UNESCO's Human Rights Exhibition has been all but forgotten. 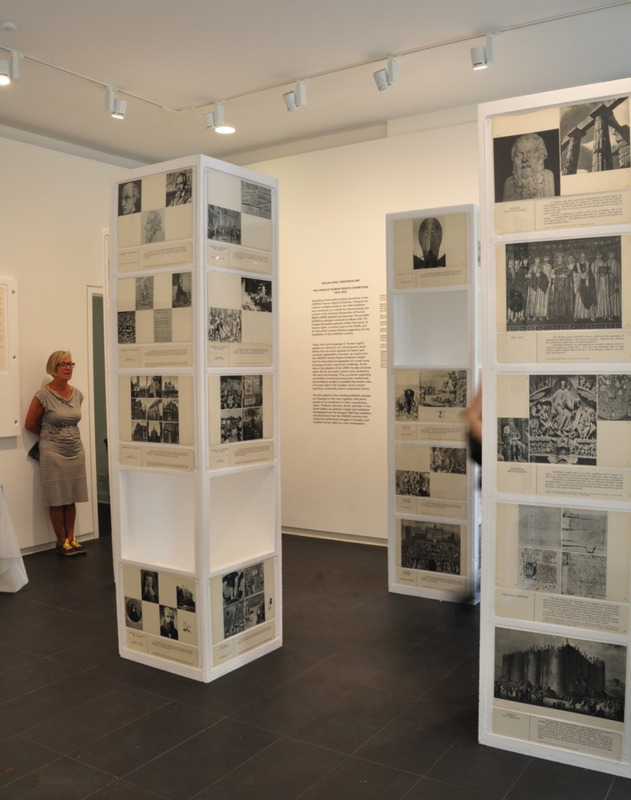 Its archive contains largely unexplored material about the organizational origins of the exhibition, the involvement of UNESCO Member States, critical responses, installation photos as well as the unique and rare traveling Exhibition Album containing 110 photographic display sheets. As a research initiative, the purpose of the project is to shed light on this historical event by mapping its story and archival contents, while analyzing it in relation to the burgeoning field of critical human rights historiography and visual culture. Yet, we approach the archive not simply in an effort to preserve the past, but to investigate its present meaning and open it up for a debate about the future of human rights. This research is made available through public events, and publications. As a curatorial initiative the Human Rights Exhibition Project re-displays and re-interprets the original Human Rights Exhibition from 1949 in a contemporary context. To re-do an exhibition raises questions: To what extent should the original material be left intact, and how far should it be deconstructed to reflect its reading in a new light, given its particular historical context? Viewers will certainly respond to the Human Rights Exhibition uniquely, and it is our ambition to re-present its archive in a manner that spurs contemplation and discussion about the role human rights have come to occupy in our contemporary moral, political and visual imaginary. Practices of visualizing human rights have undergone dramatic changes since the world’s first Human Rights Exhibition was staged in 1949. Displaying the archival material with contemporary imagery photography the project explores the ways human rights are depicted and imagined in the past as well as today. While contemporary visual representations of human rights displays suffering and the denial of rights, The Human Rights Exhibition from 1949 focused on pictures celebrating the welfare state and the historical triumph of human rights. This visual juxtaposition presents an opportunity to examine the ways in which the meaning and visual imagery of Human Rights has changed over time, and invites us to reconsider the many foundational myths that present the idea as self-evident and universal. Facade of Musée Galliéra during the Human Rights Exhibition, Paris, 1949. Installations at The Human Rights Exhibition, Musée Galliéra, Paris, 1949. The Human Rights Exhibition, re-installed at Columbia University, 2014. Photo series 'Transit' depicting the conditions of refugees in Denmark. Photographer, Michael Drost Hansen, 2014.